ORLANDO, Fla. (CNS) — For some it was about keeping young people in the church. Others wanted to hear about diocesan ministries in another locale and perhaps bring an idea home. A few more were glad they could be heard by a bishop or two. 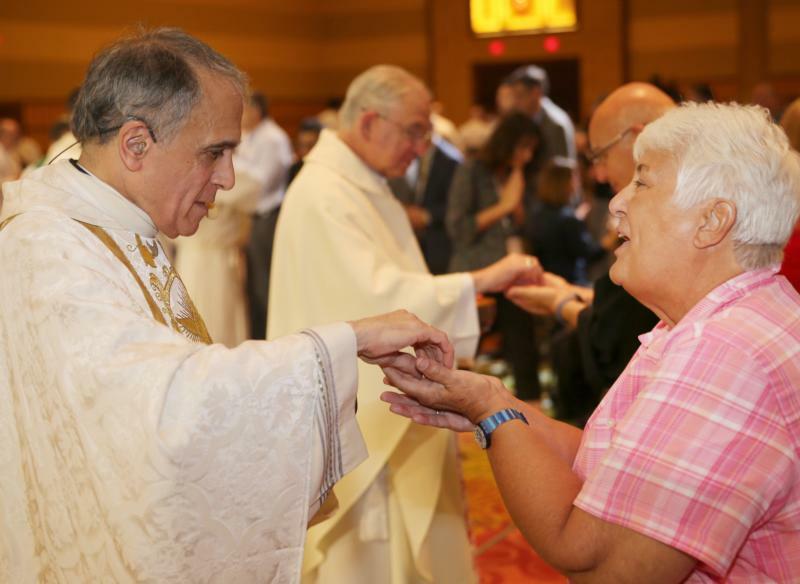 Whatever their reason to travel to hot, humid Florida for four days in the middle of summer, the 3,500 delegates to the “Convocation of Catholic Leaders: The Joy of the Gospel in America” headed home July 4 with renewed energy to set a new course for the U.S. Catholic Church. The convocation, years in planning, was the first time in a century that the bishops convened church leaders — clergy, religious, seminarians, parish volunteers and professional staff among them — to respond to social and spiritual quandaries that have left millions of people drifting on the margins of society. Clergy — more than 155 prelates and 300 priests — recognize that the church must respond to those quandaries. While cardinals, archbishops and bishops played leading roles throughout the convocation, they also were on hand to listen. They joined breakout sessions; some did not speak at all. During the final gatherings of diocesan delegations and affiliated groups July 4, bishops could be seen quietly watching and taking notes as the conversations on practical steps to undertake back home unfolded. Pope Francis fueled the impetus for the gathering. His 2013 apostolic exhortation, “Evangelii Gaudium” (“The Joy of the Gospel”), gave planners at the U.S. Conference of Catholic Bishops’ another reason for organizing the gathering. The pope’s document lays out a vision of the church dedicated to evangelization — missionary discipleship — in a positive way, with a focus on society’s poorest and most vulnerable, including the aged, unborn and forgotten. His call for a more merciful church joyfully working on the peripheries of society to heal the wounded inspired the delegates throughout the convocation. Seeing the pope’s call embraced by the delegates was exciting for Jonathan Reyes, executive director of the USCCB Department of Justice, Peace and Human Development and one of the event’s lead planners. “The joy of the Gospel is real,” he said. Meanwhile, more than 50 delegates interviewed by Catholic News Service said they felt the church — in all its perturbations and ministries — began to emerge from its many silos and turfs. They said they realized that no matter their views, they were members of one family and that they could be of better service if they imitated Jesus. “The walls need to come down,” said Sister Kathleen Burton, a Sister of St. Joseph who is co-director of the Office of Faith Formation, Family Life and Lay Ministry Formation in the Diocese of Camden, New Jersey. Delegates acknowledged that missionary discipleship will not be easy, but yet they offered views that indicated they were willing to move beyond their comfort zones in their ministry and take risks to answer the pope’s invitation. They also acknowledged that it was the words of Hosffman Ospino, associate professor of theology and religious education at Boston College, during the convocation’s first plenary session that got them to begin thinking differently about church. Near the end of his presentation, Ospino called on the church to begin “building a language of communion” rather than focusing on how to best serve specific groups of people. That understanding is becoming particularly important given that Hispanics make up about 40 percent of parish membership nationwide. Whites are at about 50 percent, with African-Americans, Asian-Americans and Native Americans encompassing about 10 percent. “In the end, when we see the church is filled with different people and we’re all worshipping the same, you see we’re all one church. These are the things we’ve been advocating for so long,” observed Juan Jose Rodriguez, director of the Pastoral Juvenil program at the Southeast Pastoral Institute in Miami. The institute coordinates and assists Hispanic ministries in the 30 dioceses of the southeastern U.S.
For many delegates, seeing the church’s diversity — Latinos, African-Americans and Africans, Native Americans and Asians from across the continent — was an inspiring sight, helping them better understand the idea of the church as family. Michelle Boyd, a Turtle Mountain Chippewa and a member of the Congregation of the Great Spirit, a Native American parish in Milwaukee, called the diversity among delegates “really amazing.” Such diversity also is what gives Boyd hope for the church’s future. The parish incorporates traditional Native American songs and prayers in liturgy and it is what attracted Boyd to return to the Catholic Church. She said similar practices along with outreach in social services, such as the parish’s food pantry, show a church going to the peripheries. Derek Rotty, director of evangelization and discipleship at St. Mary’s Parish in Jackson, Tennessee, in the Diocese of Memphis, told CNS that embracing diversity should make it easier to go to the peripheries. It’s something he said his parish must undertake. Rotty described the parish of about 1,700 families as essentially two parishes – one serving the area’s growing Hispanic population and another made up of longtime residents. He said that attending the convocation has enabled him to understand the importance of melding the two into one faith community. Vanessa Griffin Campbell, director of the Office of Ministry to African American Catholics in the Diocese of Cleveland, said the key in embracing diversity and going to the peripheries will be teamwork, with collaboration among laypeople, clergy and diocese staff being a priority.